The man is 1 foot to the left of the alien. 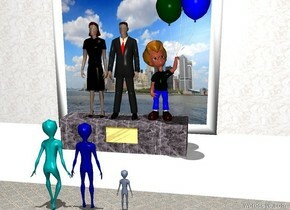 The silver ufo is 4 feet above the alien. 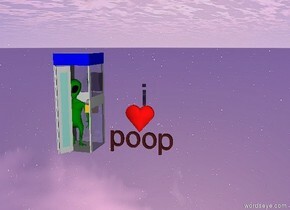 it is 20 feet behind the alien. A big yellow light is in front of the man. 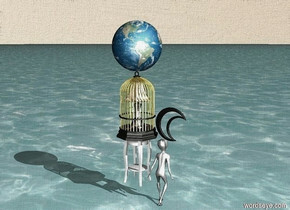 a big cyan light is under the ufo. it is night. The ground is shiny. There is a big bed. On the bed is a first big boy. the boy faces north. The boy faces up. The bed faces north. The boy is 200 feet above the bed. 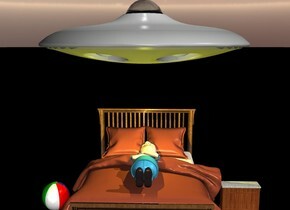 6 feet above the bed is an ufo. above the ufo is a big light. The ground is black. There is a big yellow light above the boy. There is a buffet next to the bed. There is a ball right of the bed. the ground is marble. a huge marble wall. a 100 foot long [carpet] rug is 10 feet south of the wall. a big stone cube is 3 feet south of the wall. the cube is 8 feet wide. a man is on the cube. a woman is next to the man. a big child is right of the man. a huge [new york] picture is 2.9 feet north of the man. the picture is on the ground. a shiny gold rectangle is -.1 inches south of the cube. the rectangle is tilting 90 degrees to the north. the rectangle is 8 inch off the ground. the rectangle is facing south. it is noon. a blue alien is 7 feet south of the man. 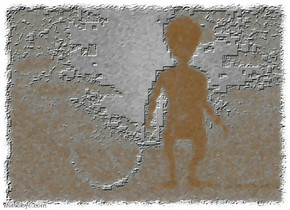 the alien is on the ground. the alien is facing north. a cyan alien is just left of the alien. 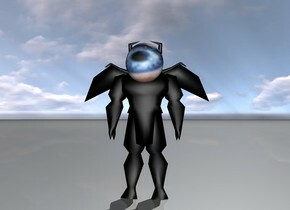 the alien is facing north. a small baby blue alien is 2 feet to the right of the alien. 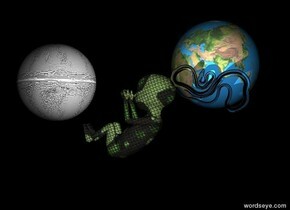 the alien is facing north. a bed. a woman is -53 inches above the bed. the woman is facing up. the woman is leaning 25 degrees to the south. the bed ' s blanket is green. the bed ' s pillow is chartreuse. a 80 feet long wall is behind the bed. the wall is 40 feet tall. a dresser is right of the bed. a first alien is left of the bed. the first alien is facing the dresser. a second alien is in front of the dresser. the second alien is facing the bed. the second alien is -10 inches right of the bed. the third alien is in front of the bed. the third alien is facing the bed. a chartreuse light is 5 feet in front of the third alien. it is night. a green light is in front of the first alien. 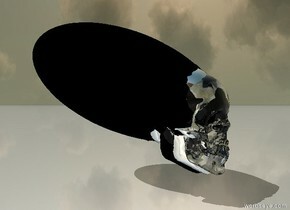 a cyan light is in front of the second alien. 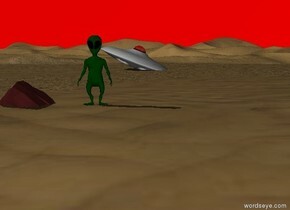 a dark green light is in front of the third alien. a black airplane. second white airplane is 2 inches right of the airplane. third black airplane is 2 inches right of the second airplane. 40 feet tall white star behind the second airplane. ground is silver. sky is black. 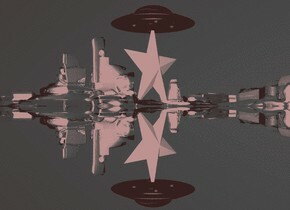 big red ufo on the star. the canyon is green. there is an alien. 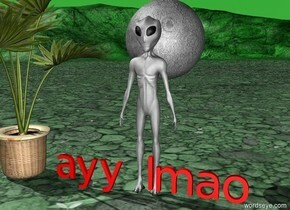 red reflective"ayy lmao" is in front of the alien. the alien is green. the alien is large. the moon is behind the alien. the moon is 5 feet above the ground. the moon is huge. the sky is green. there is a palm tree. the huge palm tree is beside the alien. 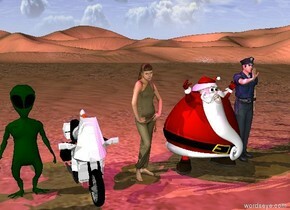 An alien is in the desert. The sky is red. 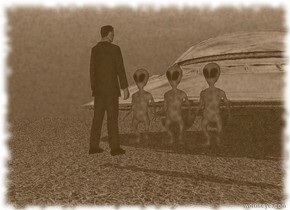 An UFO is 60 feet away behind the alien. The UFO is leaning left. 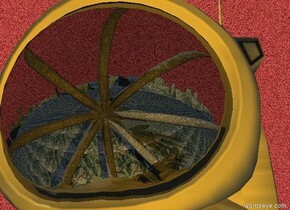 The UFO is 3 feet in the desert. A rock is 2 feet to the left of the alien. The rock is brown. the giant green alien is one foot to the left of the lion. 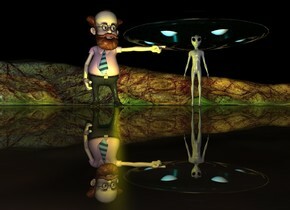 The cyan light is two feet above the alien. The red light is two feet above the lion. A large beach ball is three feet to the front of the alien. a giant pyramid is two hundred feet behind the alien. it is sunset. 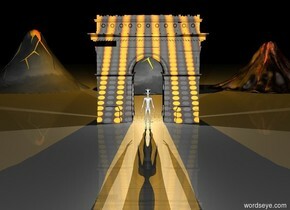 A twenty foot tall gold spider is ten feet behind the alien. A rainbow is in the sky directly behind the spider. it is on the ground. 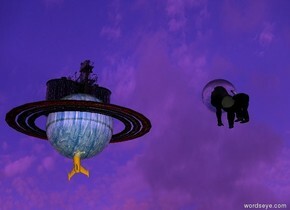 a flying saucer is in the sky seven hundred feet above the rainbow. It is evening. The house is in the field. The field is yellow. The aqua man is in front of the house. The hot pink dog is in front of the man. The dog is 3 feet away from the man. The lime alien is to the left of the dog. 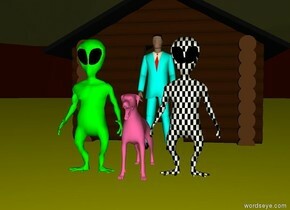 The checkerboard alien is to the right of the dog.